Ottomanson Ottohome Collection offers rugs and runner rugs that are both functional and decorative to contribute a trendy compliment to your space and home decor while preserving your floors from dirt, scratches, wear and tear. 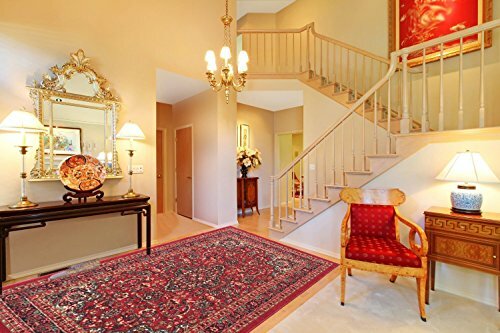 Our Persian Heriz Oriental Design Area Rug features an intricate and elegant traditional Heriz oriental design with a main dark red color in the background with a delicate royal bordered design in the hues of beige, dark-red, sage green and brown, which brings the royal feeling to your house for a reasonable price. Resistant to fading, stains and shedding, this durable rug offers a fuss-free maintanence and can be an ideal choice for homes with kids and pets as well as heavy traffic areas like hallways, kitchens, entryways, living rooms. Machine-woven loop texture with 100% nylon low-pile for long-lasting quality makes this rug easy to lay flat and feels comfortable under your, your kids' and pets' feet; while the non-slip rubber backing helps with grip so your rug stays safely in place without moving even when you vacuum. Convert your house into a home with a finishing touch by simply setting one rug from this collection under your kitchen table, in your living room or by your foyer to greet your guests in a gracefully welcoming manner.